In Part 1 of this series we created the required Roles, Profiles and Class as collections within SCCM. In Part 2 we created a web service which queries SCCM and then creates ENC compatible responses, which can then be consumed by Puppet. In this next post, we’ll configure Puppet to use our ENC web service and then try out some node classifications for real. If you already have a running Puppet master and agent, you can skip this section. Puppet offers a Learning Virtual Machine (VM) which is a quick way to create Puppet Master. Either SSH into the Puppet Master Virtual Machine, or use the console. Use curl to send a web request. The --verbose argument shows the HTTP response headers. Puppet can not call curl directly so we need a simple shell script that Puppet can call. We haven’t defined a Role or Environment for our Puppet Master! Fortunately the Puppet Console still holds all of the node classification information, so we can use that to build the required response for the Web Service. We could update the script so that if our Web Service fails to find a definition then it could query the original Node Classifier API. This is the best of both worlds where we can use the the native capabilites of Puppet to manage itself, and then use SCCM for other Nodes. However this a little advanced for this blog post. In Part 4 of this blog series we can revisit this. This would be fairly straight forward to add into SCCM but does require a bit work to get the system objects imported into SCCM. Getting non-Windows computers to register in SCCM is quite tricky. Also our ENC doesn’t support class parameters yet. In Part 4 of this blog series we can revisit this. In this case, when a request for a specific hostname is received, we can return a static response instead of querying the SCCM database. We’ll use this method in this post as it’s very simple to implement. A new function called Get-StaticNodeResponse takes a single input parameter of the node hostname, and then uses a simple switch statement to either return a YAML node classification string, or an empty string. The Get-NodeResponse function is modified to first call the Get-StaticNodeResponse function. If the static response is not empty the it returns the static response, otherwise it continues the usual process of querying SCCM. Uh oh. Looks like the node_terminus setting was put back to classifier. Now that the Puppet Master is functioning correctly we can move on to classifying other nodes. Now that the Puppet Master is functioning correctly, we can now start classifying nodes in SCCM and see the results on an agent. The test node in the following examples a Windows 10 desktop with a name of desktop-urvo7t4.sccm-demo.local. It’s not your typical server setup, but it will serve the purposes of testing an ENC. Well, that’s kind of expected as we haven’t added this computer in SCCM yet. Install the SCCM Agent and it should soon appear in the SCCM Console as a Device. Remember in Part 1 we created all of those collections? Well now it’s time to use them. All nodes need to have an environment set so first we add the test node to the Puppet::environment::production collection in SCCM. This isn’t quite what we expected. The Web Service output shows it retrieved the correct classes for the Web Server role, but the Puppet run failed. After a quick look on the Puppet Master, the answer is obvious. We hadn’t yet added the modules for the Adventure Works site onto the Puppet Master. This meant that even though the node classified correctly, the Puppet Master couldn’t compile a catalog for the node. I created demo modules and are available in the blog code repository. These modules merely output Notify messages on the console for the various class names. 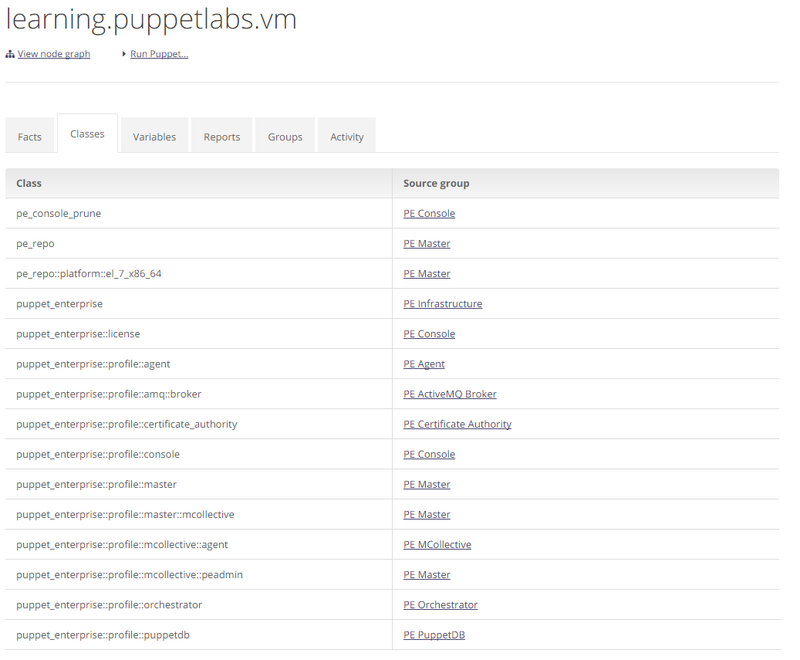 On the Puppet Learning VM they can be copied to /etc/puppetlabs/code/environment/production/modules. Success! The node is classified correctly and we can see that the correct classes have put out Notify messages in the Puppet console. As expected, the node classification picks up the database classes. And again as expected, the node classification picks up the HA Proxy classes. 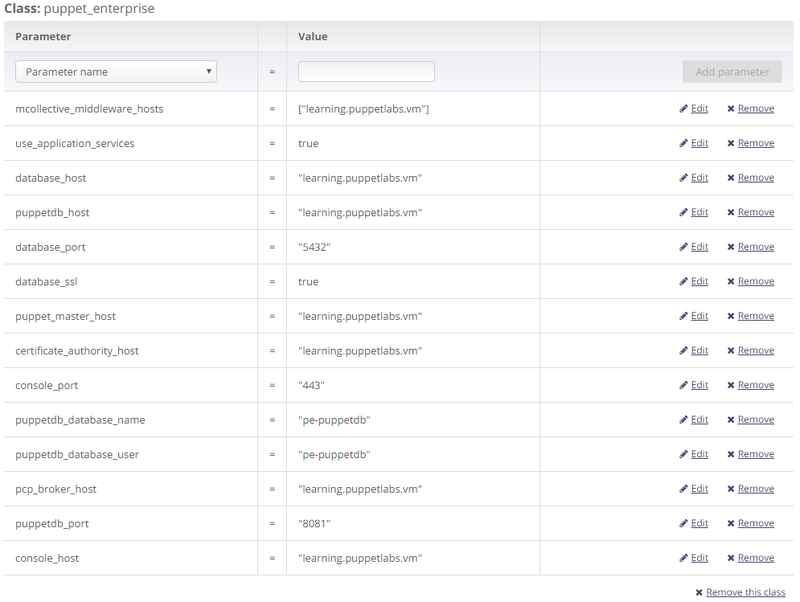 So we’ve managed to create the Roles and Profiles pattern in SCCM, create a Web Service which serves ENC compatible YAML files and configure Puppet to use SCCM (with Static classifications) to classify Nodes! Many people feel that SCCM and Puppet are mutually exclusive, in that you can’t use both at the same time, but I like to think that they are complimentary. SCCM does a lot of things Puppet does not, Puppet does a lot of things that SCCM does not. If you need to, you can integrate the two systems together to manage your server fleet. There are still two outstanding issues to look at regarding the Puppet Master node definitions. In Part 4 we’ll revisit the ENC script and look at using the inbuilt Puppet Node Classifier as a fallback. We’ll also look at adding class parameters in SCCM and exposing them via the ENC.